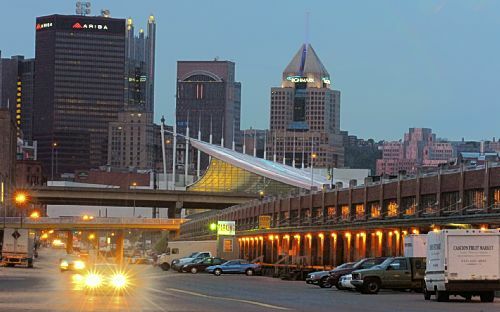 As many of you know, the Produce Terminal is a Pittsburgh historic landmark located in the Strip District, on Smallman Street. It is a very long, low building that resembles a city market, with bays open to the street. It is a unique building which contributes to the old market-place character of the Strip District. There are plans to demolish one block of this building, between 16th and 17th St., for new development. There will be a public meeting held at 2100 Smallman St. (on the 16th St. end of the building) on August 15th, 2011, at 6:00pm, to discuss concerns regarding the demolition. This is the place for the historic preservation community to make its voice heard in regard to preserving the whole structure. Correction: A reader corrected me about the Produce Terminal's status as a "historic landmark." Currently, it has no designation as such. However, it can still be nominated, as it lies in a National Register eligible district. It is not a Pittsburgh historic landmark -- it has no designated historic status, though it is part of a national register eligible district. The building needs to be designated to the local register, which might afford it some protection against demolition.